Hunting season or morning chores, this sherpa-lined hat for little kids is designed with cold weather in mind. It has a lightweight polyester exterior and a plush fleece lining. Extended chin straps secure it in place and add warmth. It looks good and will keep your little one warm. Hat is Very soft and comfy. 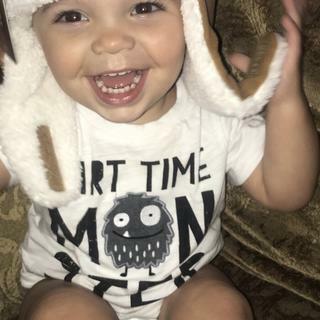 This hat is so warm and my son loves it. He looks absolutely adorable wearing it and it matches his Carhartt jacket. What head circumference does this fit? BEST ANSWER: This will fit a head measurement of 20 1/2-22 3/4 inches. What head circumference would this hat fit? BEST ANSWER: The crown circumference of this hat is about 23." Is this hat for an infant,toddler or kid? BEST ANSWER: This is considered a toddler hat. how's the size?what age will it fit? BEST ANSWER: A toddler, or a small child. Probably ages 2 - 3. It runs big. My son is 18 months but is in the 80th percentile for head size. I bought it for him last winter but it fits him right now. Hope his helps! our 3 year old boy still fits into it. A bit tight, but his head is on the bigger size. It is slightly big for my 2 year old, but will fit great this winter!